1. Who are we interviewing/observing? 2. What are we learning about them? 3. What do we notice about/strikes me as distinctive about the location/environment/neighborhood? 3. How can my trek findings serve as data points for salient patterns that might inform future persona profiles and scenario narratives? 4. What is the most effective way to represent our TREK findings? Up to now, this class has pursued the following activities : 1. FORESIGHT: we have explored possible ways to think about NORMATIVE SCENARIOS for LIFE2050 broadly and generally through discussion from our own personal points of view as well as surveying scenarios from planners, economists, political scientists and futurists who create future strategic scenarios for public, private and civil organizations. We have familiarized ourselves with PLANPGH, the comprehensive plan for metropolitan Pittsburgh to horizon year 2035. Class teams have identified three pathways toward desired futures to explore as their design lab project; i.e. : LEARNPGH, SHAREPGH and OPPORTUNITYPGH. FARSIGHT: We have begun to look laterally at “the edges” of design to adjacent fields in order to discern EARLY SIGNALS/FUTURE SIGNS of FORCES OF CHANGE that are likely to shape the future and suggest opportunities to proactively DEXIGN THE FUTURE. INSIGHT & FORESIGHT: Now it is time to try to step away from our own personal biases and preconceptions and begin to envision the future from the perspective and the lived experience of the people who are going to live in the future. To do that, we need people to design for, with and by – people who are going to inhabit and experience the future, specifically LIFE2050 in PGH3.0 – people who are not us and not today’s planners, futurists, scholars and experts. 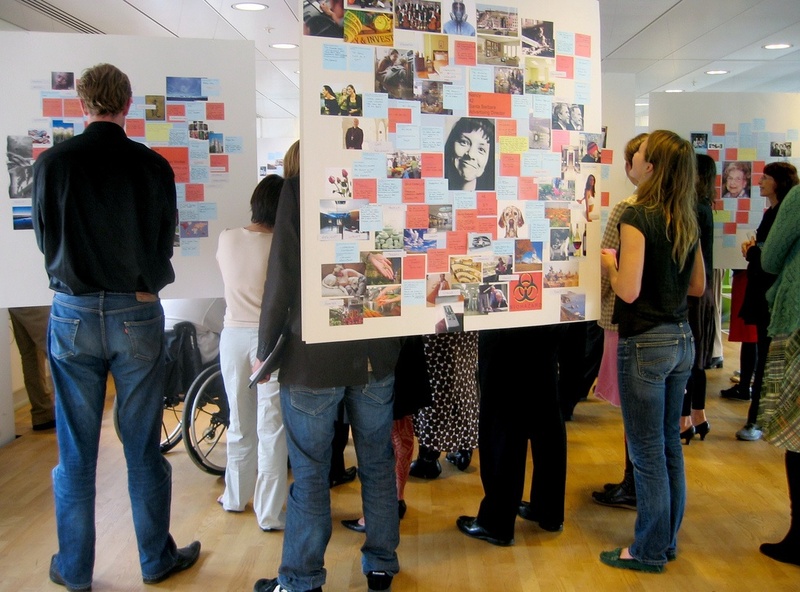 A way designers do this is through PERSONA-BASED SCENARIOS – narratives of the future (sometimes called “future fictions”) told through the lived experience of PERSONAS – composite characters usually comprised of characteristics drawn from informed imagination and present day observed study subjects. We conduct EXPEDITIONARY TREKS to observe and interview real people today in their accustomed situations. Here our purpose is not to gather projectable statistical data. Rather it is to uncover what interests, influences and motivates peoples’ attitudes, behavior and lifestyle today and how they express their concerns, dilemmas and hopes for the future. These serve as data points of reference for attributes and salient patterns that might inform future persona profiles and scenario narratives for our FUTURE PERSONA cast of characters. Following are some of the Collective Invention templates and frameworks we will refer to in creating a gallery of FUTURE PERSONAS. 1. Build Persona Profiles CI_Personas_toolkit#2 Pp. 1 -7 show a template for building a PERSONA MANDALA or profile. You can substitute content relevant to your own field of focus. 2. Conduct Field Research CI_Personas_toolkit#2 Pp. 8 – 12 show templates for an EXPEDITION TREK to observe and interview subjects in the field. Following pages are example templates for PORTRAIT CARDS to be filled in to build out the PERSONA MANDALA. 2. A SCENARIO NARRATIVE v. 1.0 FOR EACH PERSONA: Look at Collective Invention PERSONA SCENARIOS as reference. 3. FORCES OF CHANGE PATHWAYS: Each narrative should reflect three or more FORCES OF CHANGE PATHWAYS relevant to your FOCUS FIELD of LEARN, SHARE, OPPORTUNITY. Look back at pathway examples in future strategic scenarios from WBCSD and other international organizations. In particular, remember to look back at the GREEN DENMARK scenarios 2050 GREEN DENMARK SCENARIOS and at all the reference materials under Assignment 8-B on DAY 8. 4. 2050 BENCHMARK GOALS: Each narrative reflects three or more 2050 BENCHMARK GOALS relevant to your FOCUS FIELD. Look back at pathway examples in future strategic scenarios from WBCSD and other international organizations as well as PLAN PGH, EAST LIBERTY PLAN, etc. In particular, remember to look back at the GREEN DENMARK scenarios 2050 GREEN DENMARK SCENARIOS and at all the reference materials under Assignment 8-B on DAY 8. 5. EARLY SIGNALS/FUTURE SIGNS: Each narrative reflects three or more EARLY SIGNALS/FUTURE SIGNS for FORCES OF CHANGE PATHWAYS relevant to your FOCUS FIELD; I.E. : LEARN, SHARE, OPPORTUNITY. 6. LIFE2050PGH3.0: Represent all the above as an experience in a web site or blog or other platform branded as LIFE2050PGH3.0 (or a better title if you can come up with one.) Assume you are A LAB IN THE IDEATE NETWORK authoring this site. Assume your audiences are some combination of the following…you choose your target audiences and have a rationale for why your choice will best amplify, accelerate and scale progress toward your PATHWAY BENCHMARK GOALS; e.g: – Citizens of Pittsburgh in general ? – Residents of your target neighborhoods? – PGH metroregion planners, elected officials, administrators, businesses,? – Venture entrepreneurs, investors, developers, start-ups, incubators, accelerators, collaborators across CMU, PITT, PGH, developing neighborhoods? – Academic institutions; i.e. : CMU, PITT, CREATE LAB, etc? – K-12 educatlon system; i.e: administrators, teachers, students, parents? – Civil associations; i.e. : philanthropies, charities, social organizations, international organizations? – Other metro regions? – The nation?